Original art exhibitions, enhanced onsite experiences, and expanded food and beverage offerings have been revealed for the first-ever Sonic Temple Art + Music Festival, Friday, May 17, Saturday, May 18 and Sunday, May 19, 2019 at MAPFRE Stadium in Columbus, Ohio. 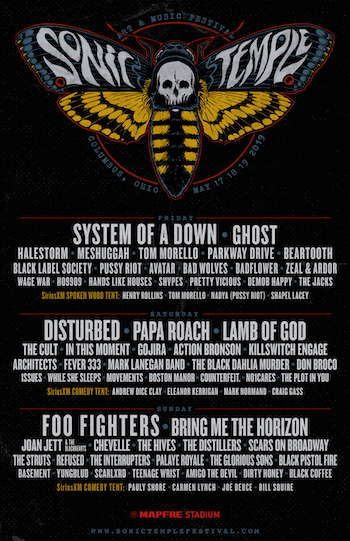 The much-anticipated festival, produced by Danny Wimmer Presents, includes performances from multiplatinum artists Foo Fighters, System Of A Down and Disturbed among a diverse lineup that also features top artists Papa Roach, Bring Me The Horizon, Ghost, Lamb of God, Halestorm, Chevelle, Joan Jett & The Blackhearts and The Cult, as well as Andrew Dice Clay, Henry Rollins, Pauly Shore and more in the SiriusXM Comedy & Spoken Word Tent. In addition to featuring the biggest music artists, Sonic Temple Art + Music Festival brings together some of the best visual artists around for an immersive experience like never before at a Danny Wimmer Presents festival. Headlined by legendary street artist RISK, the visual art components will allow attendees to come face to face with amazing art installations, live mural painting, and live screen-printing across the entire festival grounds, as well as additional activities inside the festival's Art Tent. Other artists who will be displaying their work onsite include Palehorse, Ricky Watts, Lauren YS, Brian Ewing, Angryblue, Sean Dietrich, and more to be announced. To Write Love on Her Arms (https://twloha.com) will also have a presence onsite. This non-profit organization aims to present hope and find help for people struggling with addiction, depression, self-injury and thoughts of suicide while also investing directly into treatment and recovery. General Admission, VIP and Premium VIP tickets, and hotel and camping packages are on sale now at www.SonicTempleFestival.com. In addition to performances from top music artists, and various onsite attractions, attendees will enjoy a variety of onsite food and beverage offerings that celebrate local Columbus flavors. Curated by Southern Hospitality Concessions LLC, DWP's affiliate concessionaire, selections from the following local and regional restaurants will be available: Bonifacio, BruBrothers Coffee, Buckeye Donuts, Cheese Louise, Chicago's Dog House, Cousins Maine Lobster, Dirty Frank's, Eli's BBQ, Ena's Just Jerks Kitchen, Graeter's Ice Cream, Hai Poke, Hangry City, Iron Grill BBQ, fan favorite Island Noodles, Master Of Patties, Midway Wing Co., Mikey's Late Night Slice, MoMo Ghar, Pie Baby Wood Fired Pizza, and Schmidt's Sausage Haus. Fans 21+ can enjoy multiple specialty curated beverage experiences. Varietals from Caduceus Cellars & Merkin Vineyards (owned by Maynard James Keenan, co-founder of international recording acts Tool, A Perfect Circle, and Puscifer) will be available at the Caduceus Wine Garden. The Big Bourbon Bar presented by Kentucky Bourbon Trail®, will feature more than two dozen hand-selected bourbons from top distilleries, and a unique opportunity to enjoy bourbons and exclusive one-time specialty cocktails. Experience abounds at the Heavy Tiki Bar (a tropical oasis filled with killer cocktails and shade). Fans can also enjoy a large variety of local and regional brews at the Sonic Temple Craft Beer Bar. Sonic Temple Art + Music Festival sponsors include: Monster Energy, Zippo, f.y.e., Sweetwater Studios, BrewDog, Jack Daniel's, The Music Experience, USMC, Kentucky Bourbon Trail®, and Fxck Cancer / Dyin 2 Live Dreams Program. Sonic Temple Art + Music Festival is produced by Los Angeles-based Danny Wimmer Presents, one of the largest independent producers of destination music festivals in America. DWP events include Aftershock Festival, Bourbon & Beyond, Chicago Open Air, Epicenter Festival, Hometown Rising, Louder Than Life, Sonic Temple Art + Music Festival, and Welcome To Rockville. They're also the co-creators of Rock On The Range, America's largest and most acclaimed rock festival, which celebrated its 12th and final year in 2018 with 140,000 in attendance; Carolina Rebellion, which wrapped in 2018 after 8 record-breaking years, including over 100,000 in attendance multiple years at the annual event; and Northern Invasion, which had 50,000 in attendance for its fourth year in 2018. Since 1993, music industry veteran Danny Wimmer has been producing concerts and festivals, both large and small. In 2011, he formed Danny Wimmer Presents, which now produces several of the largest music festivals in the U.S. By combining A-list talent with local cuisine and culture, DWP has become recognized within the industry for delivering the highest-quality entertainment experiences to fans, artists, sponsors, partners and host cities. DWP creates memorable and all-encompassing festival experiences, leaving both consumers and partners with lasting and meaningful impressions. DWP will continue to add new music festivals to its already stellar portfolio, which includes Rock On The Range, Aftershock Festival, Welcome To Rockville, Carolina Rebellion, Louder Than Life, Bourbon & Beyond, and Chicago Open Air, among others.